So much of this 21st season of Survivor has paled in comparison to its 20th iteration. The castaways were not only unfamiliar, but seemingly unenlightened in how to play the game. The outsize personalities were less polarizing than simply unpleasant, and none of the final five could really lay claim to controlling the game for extended periods of time. But Survivor: Nicaragua did deliver something that Heroes vs. Villains couldn’t: a completely compelling and satisfying finale with a more-deserving-than-we-thought winner. Let’s take a spin. The “Previously on…” established the narrative arcs and the relative strengths and weaknesses for each of the final five castaways. Dan had done nothing, but that included not making any enemies. Holly had a nervous breakdown before taking down the game’s most powerful player in Brenda. Chase seemed to show genuine remorse each and every time he voted off an ally. Sash had made innumerable side deals, allying himself with everyone (and, as a result, no one). JudFabio was dumb—or was he?—and is a physical threat to win immunity. I hope you don’t have a problem with me poaching part of this from last season’s “Previewing the Finale” post. My attitude on Survivor finales hasn’t really changed in the last seven months. If you already read that post, just skip down to the first bold headline. 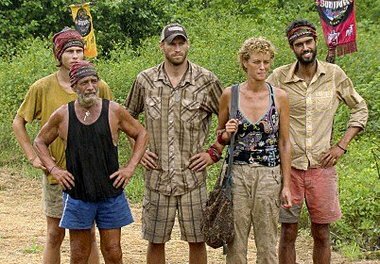 Tonight is the season finale for Survivor: Nicaragua, and even though this has been, by nearly every measure, a disappointing season, I would describe my excitement for this evening’s proceedings as embarrassingly high. Survivor finales have regularly amped me up more than the finales of any other drama. This is for two main reasons. First, they provide closure in a way no other series does, for I think the obvious someone-wins-and-there-ain’t-no-cliffhangers reason. Second, most of the great dramas I have watched recently (The Wire, The Sopranos, Dexter, Mad Men, and Lost), I have watched either online or on DVD, meaning I can watch the finale immediately after the penultimate episode. This is one of my least favorite things about watching shows on DVD. I love the Survivor finale because, no matter how clearcut it seems going in, you can never rely on the fickle psychology of the jury. You can’t predict which players will graciously vote for the person who caused their elimination because he was the best player, which ones will remain loyal to their alliances long after they’ve died, and which ones will hold long-term grudges. These questions are only amplified by the ambiguity of watching a season of Survivor: We the viewers only see so much, and it’s no secret that the editing plays a big role in the portrayal of different characters. In the wake of Jimmy Johnson’s dismissal last week, Wednesday’s fourth episode of Survivor: Nicaragua, “Pulling the Trigger,” was bound to deal with the aftermath in the older, Espada tribe. More specifically, it was bound to deal with the tension between Marty, the man who largely orchestrated Johnson’s departure, and Jimmy T., the man who thought Johnson was threatened by his leadership skills, even as he (Jimmy T.) was the one who beseeched “Coach” to “put him in” the week before. Let’s face facts: The first episode of a Survivor season is never any good. There’s way too many people with way too many names explaining the same tried-and-true Survivor principles. Fire is important. I’d like to make an alliance or two, but I don’t want to be overaggressive. Being a leader requires a deft touch this early in the game so as not to become a target. Survivor is really hard. I don’t even want the million dollars. Okay, so the last one is new this season, and it comes from the biggest star the series has ever been able to nab: Former NFL head coach Jimmy Johnson. Johnson’s appearance on Survivor is, going in, easily the most interesting reason to watch this iteration of the show. Johnson, to me a shocking 66 years old, was fairly easily recognized by most of the castaways,* and he came clean early, saying he was there for the adventure and not the money — which his tribemates did not believe. *The last thing I wanted was a weird, “Nobody recognizes me?? ?” plot.